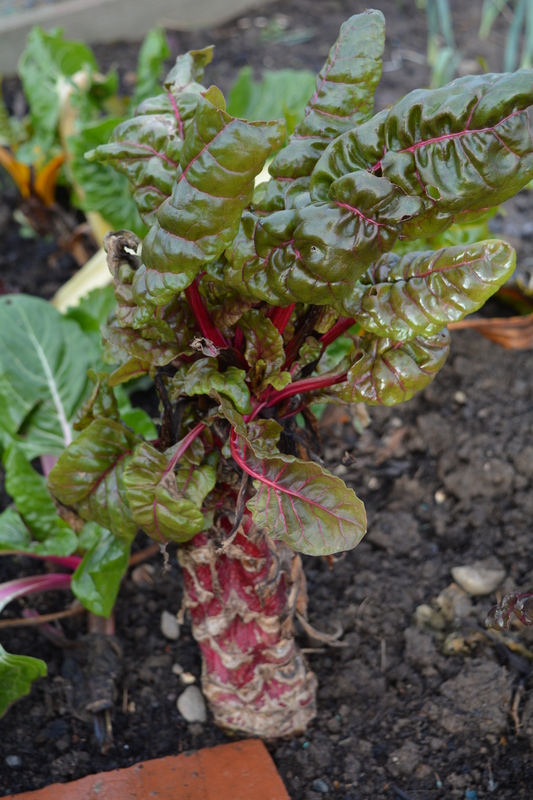 We took a walk around our allotment site today to see what was going on and check that everything was okay. 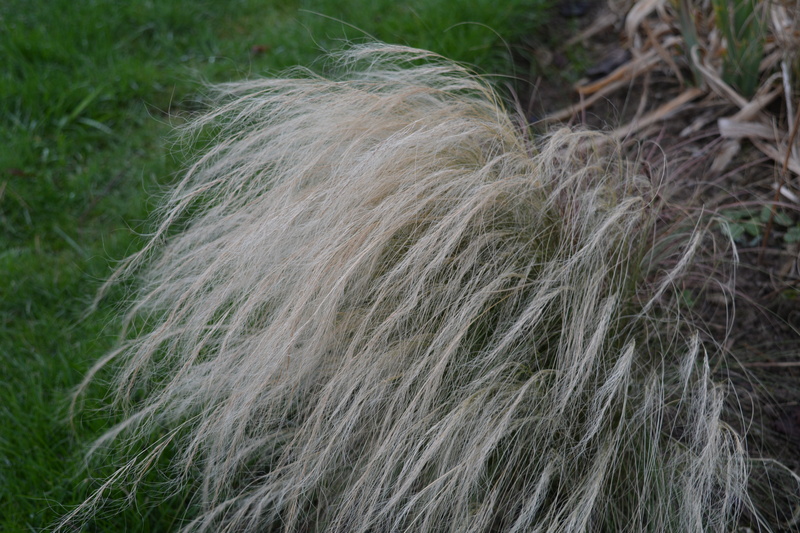 We had just watched the site on TV as we featured on a BBC2 series called the Great British Garden Revival. 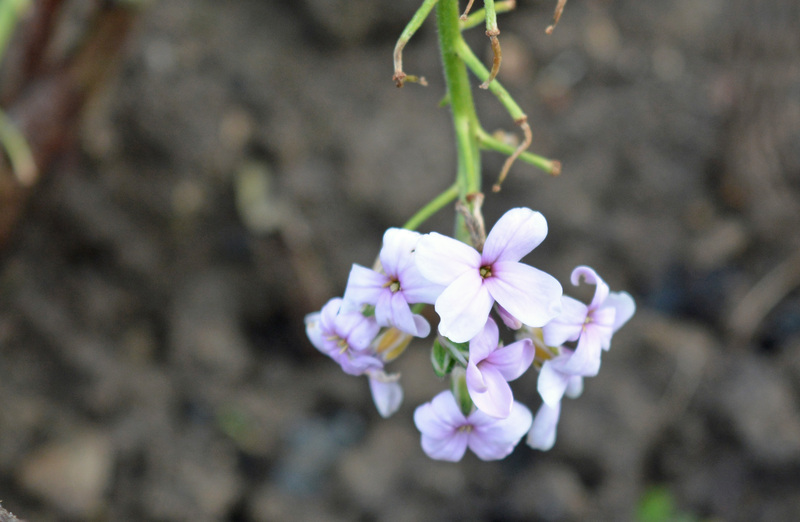 I filmed with Dermuid Gavin a feature on wildlife gardening. It was a strange experience seeing our allotment site on the screen but even stranger seeing our own plot being used as an example of a wildlife friendly garden. For today’s wander we arrived during a period of sunshine with a clear blue sky over our heads, but by the time we were half way around the clouds had arrived and we were subjected to light but very cold rain. 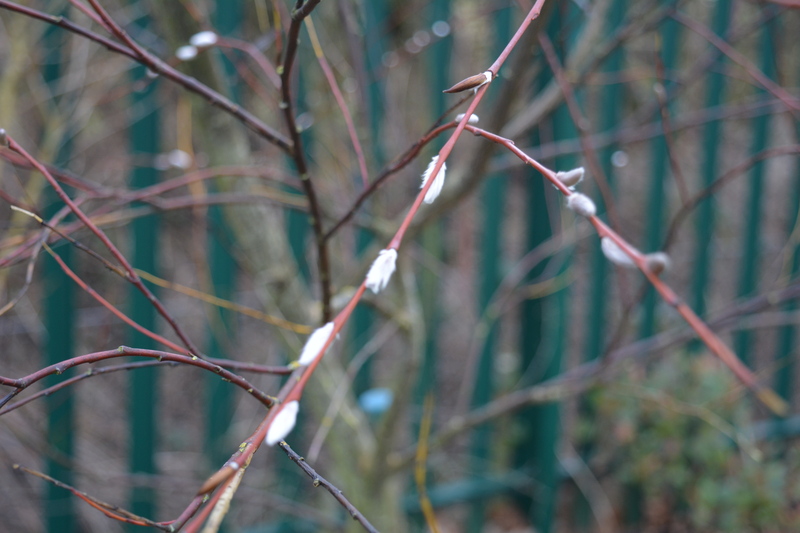 The pure white catkins of the Violet willow in the Spring Garden sit like droplets of rain water after a storm. They are bright enough to be visible from a long way away. They draw attention to themselves very well! 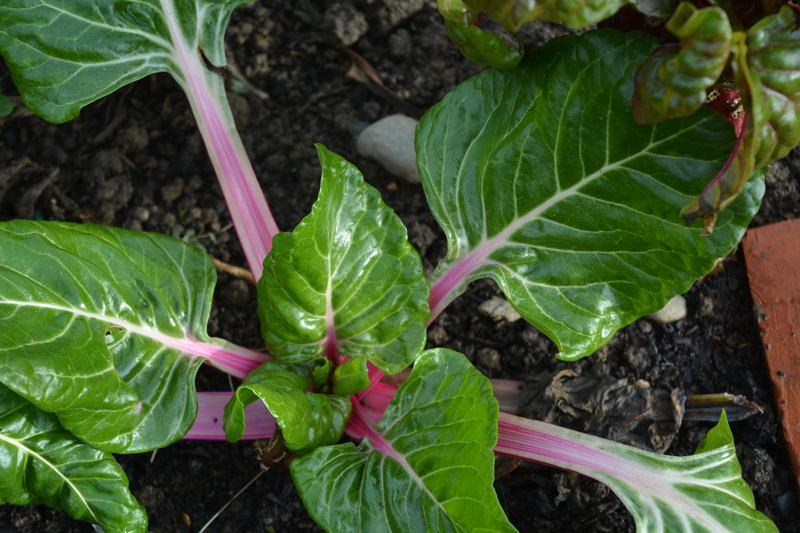 Probably the brightest of winter colours on any veg plot is provided by Swiss Chard especially the cultivar called Bright Lights. 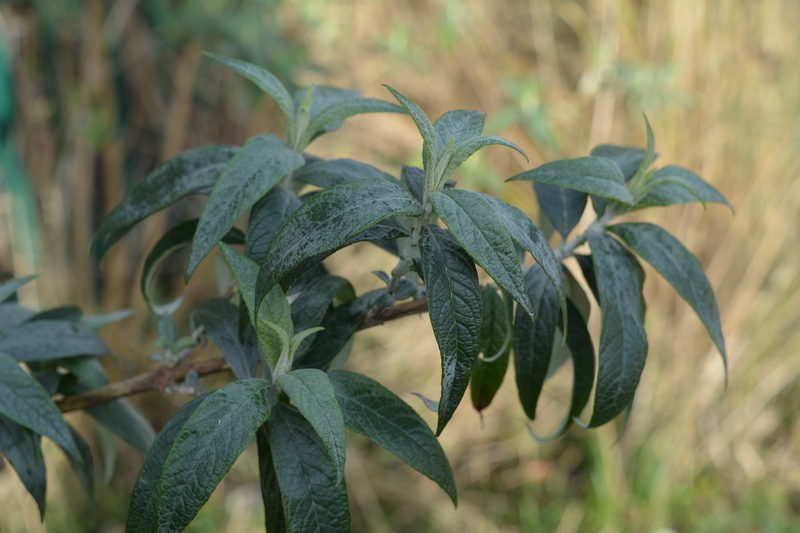 Light catches on the textured leaves emphasising their undulating surface. 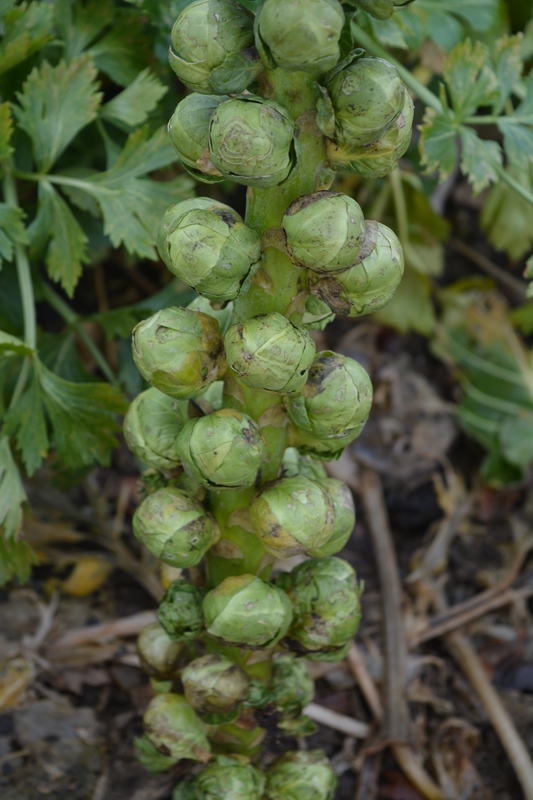 The other crops still in evidence are sprouts that have overwintered and the new fresh foliage of the Globe Artichoke. 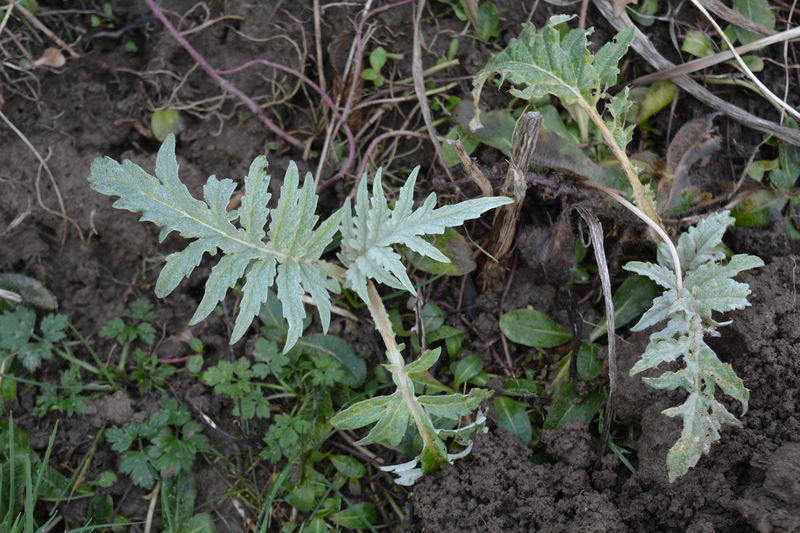 These leaves now just a few inches long will expand to a massive few feet in length and the plants will reach a good nine or ten feet in height. 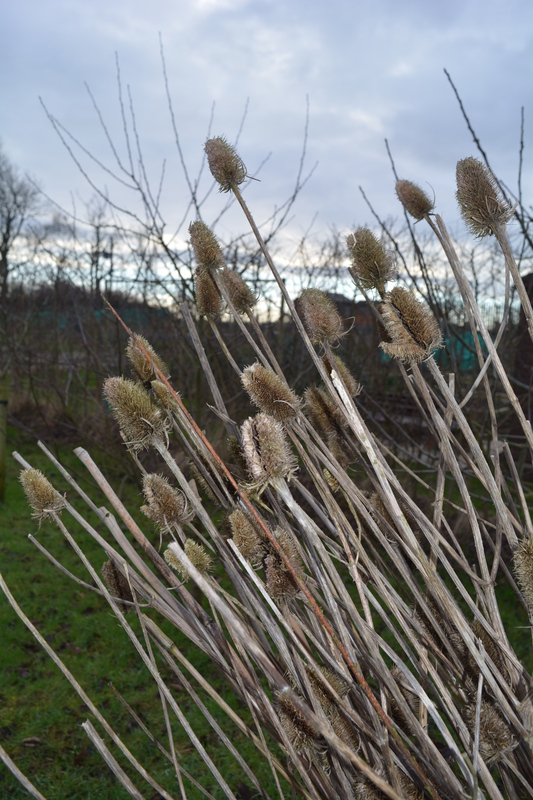 Their purple, teasel like flowers will delight our pollinators the butterflies, bees and hoverflies and the seed heads that follow will be a magnet to greedy Goldfinches and Linnets in the autumn. 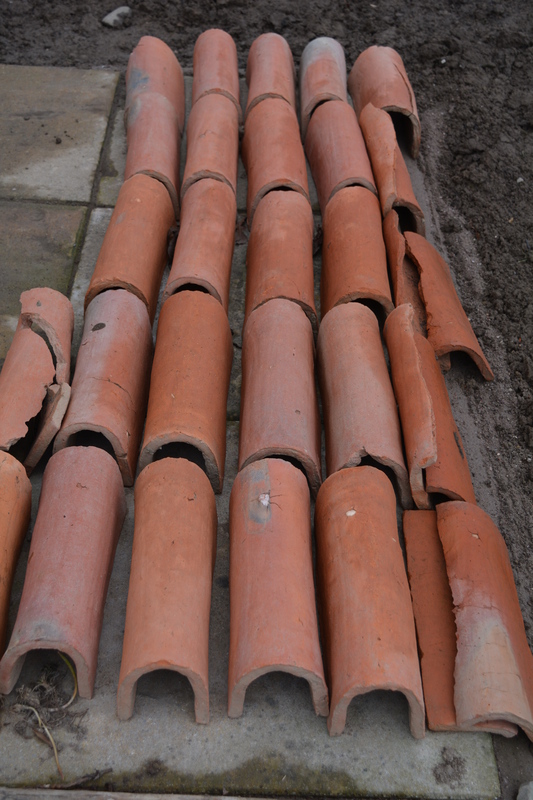 Perhaps the strongest pattern of all was found on Tom’s plot, where he has set out all the old clay drainage pipes that he dug up from his plot. 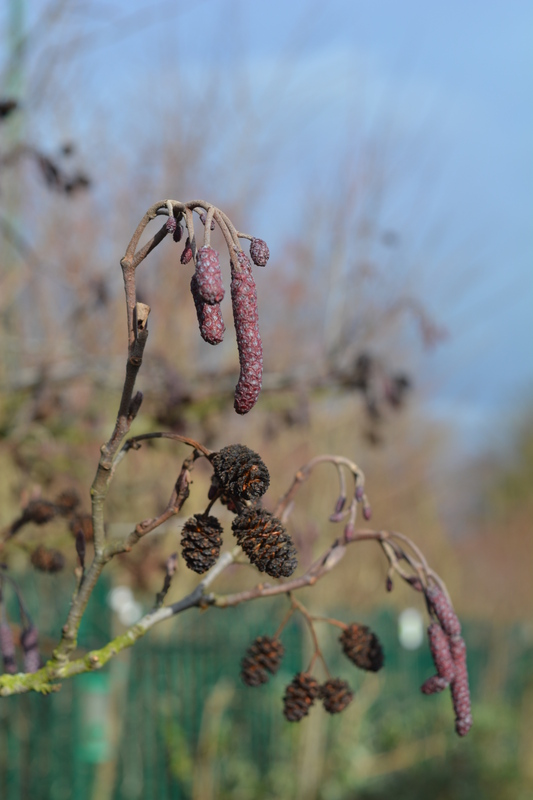 Both the male and female catkins glow purple on the Alders in the Autumn Garden where their neighbours the Buddlejas are showing fresh foliage with their texture like reptilian skin. 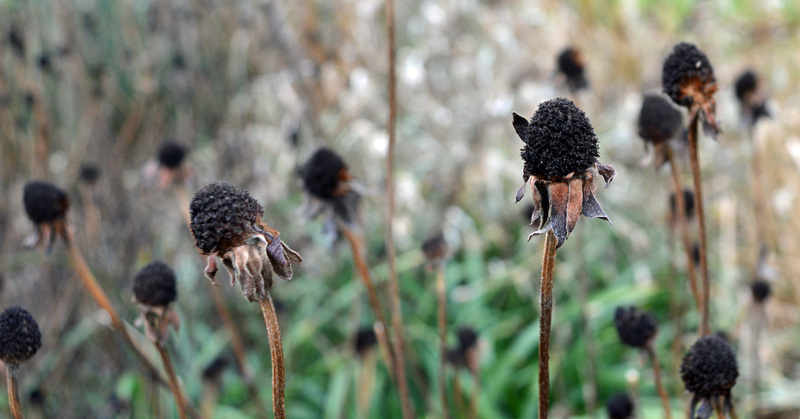 Last year’s plants in the meadows and borders are now skeletons of their former selves. 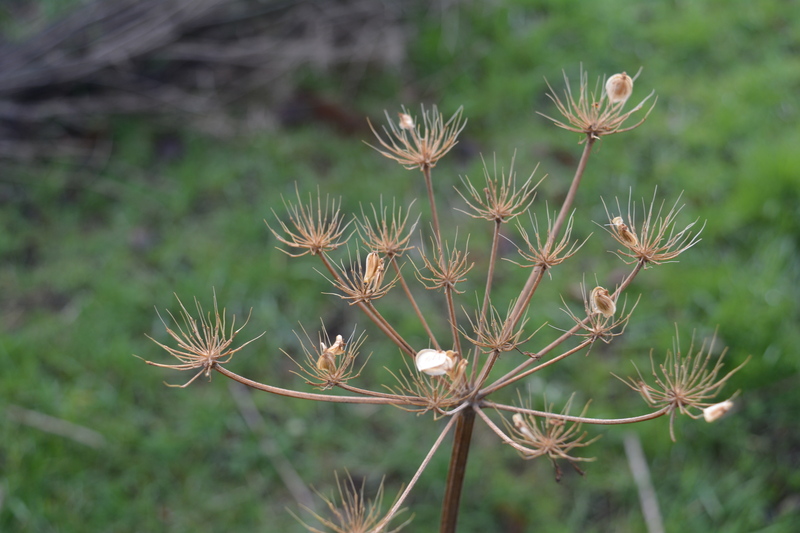 There is a strong structure linked with subtle beauty in these spent seed heads. 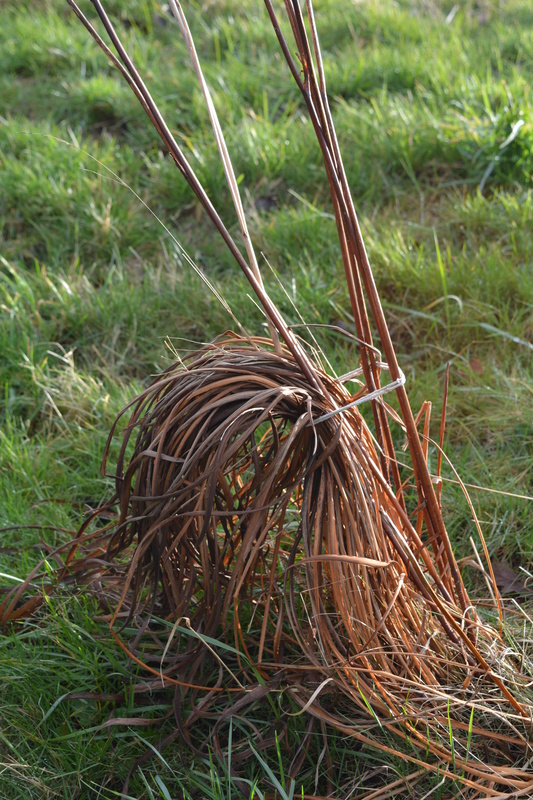 The wildlife shelters sitting in the orchards and meadows hide so many hibernating creatures. 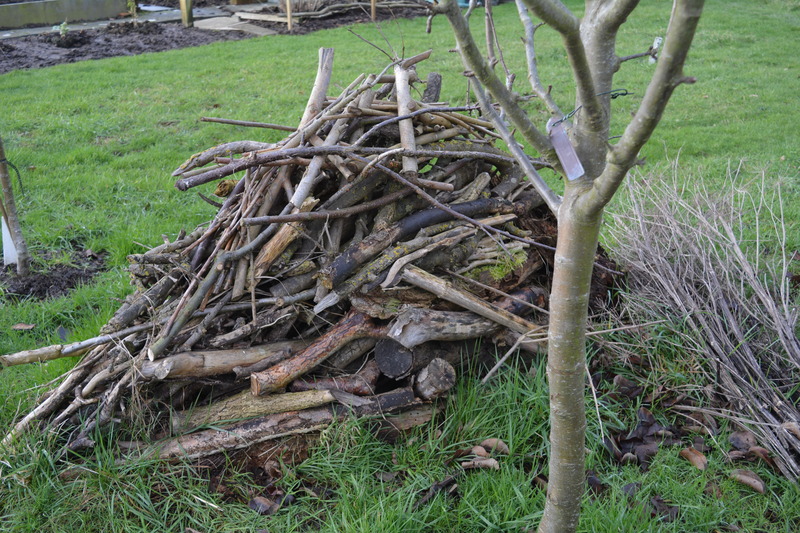 They shelter creatures from the winter cold and house anything from the tiniest insects up to amphibians such as frogs, toads and newts, birds like Wrens and Dunnock and mammals including our confident Weasels. 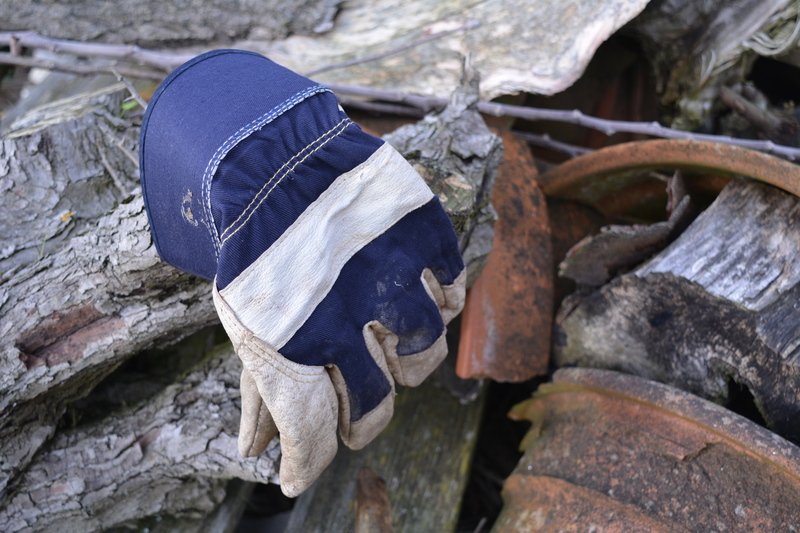 A lost glove adds a splash of colour! 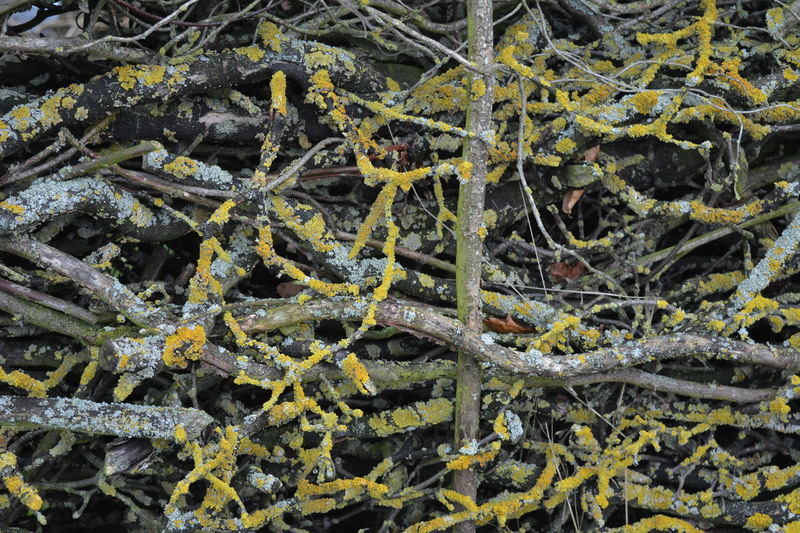 In our “Dedge” the bright colours of the various Lichen, yellows, chartreuse and greens, glow however dull the light is. 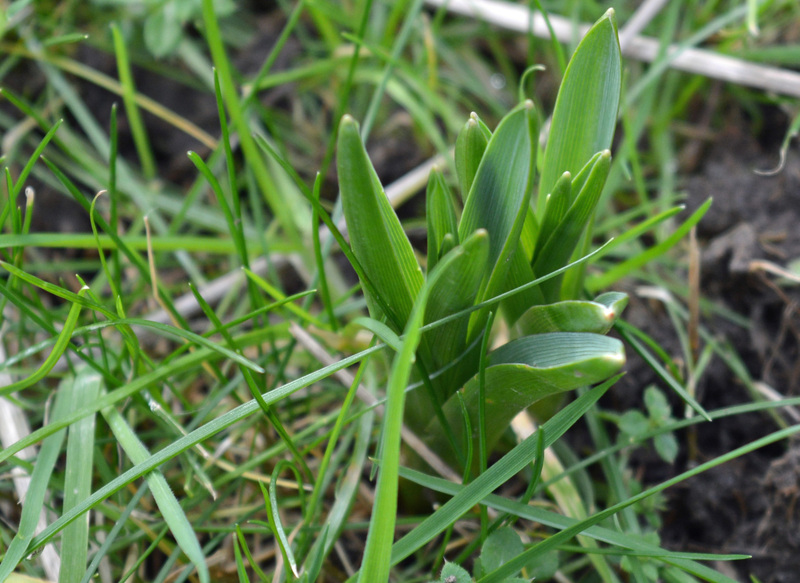 A few spring flowering bulbs are showing spears of green piercing the cold soil. 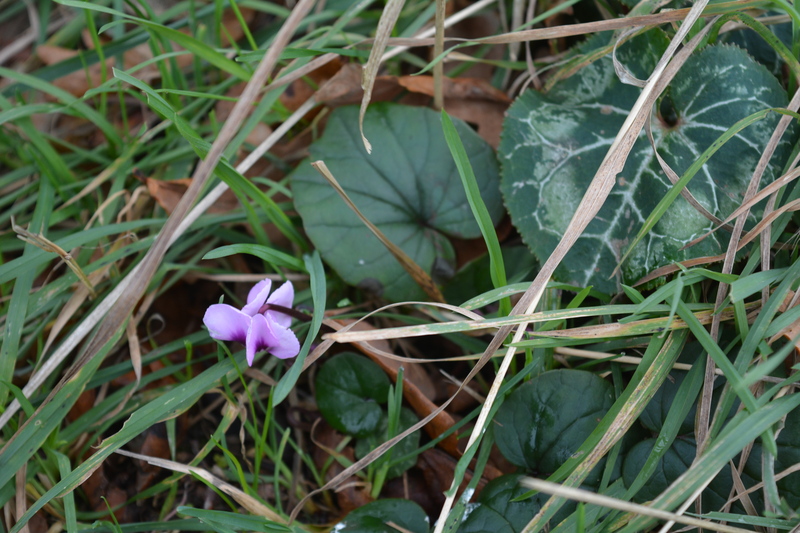 Some are even flowering such as the diminutive Iris reticula and Snowdrops. 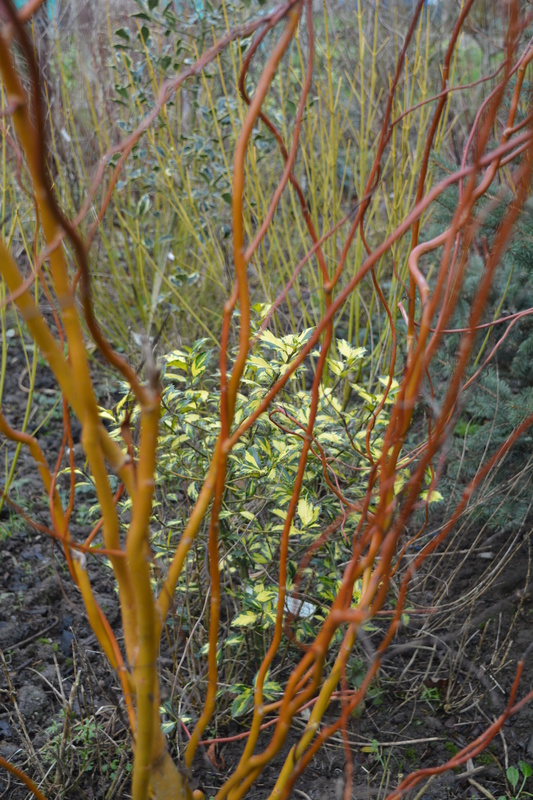 Variegated foliage always looks good in the winter when the silver or gold stripes, spots or squiggles shine against deep green backgrounds. 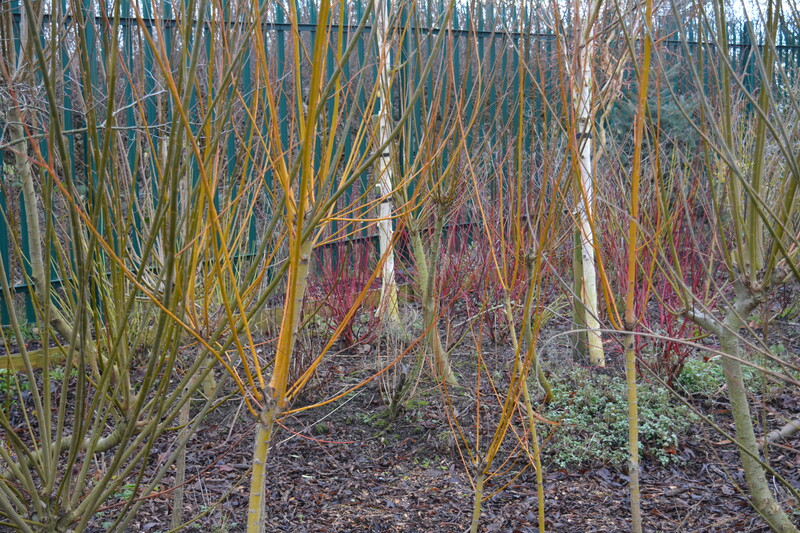 Perhaps it is only right that the most colourful and interesting garden of all at the moment is our Winter Garden. 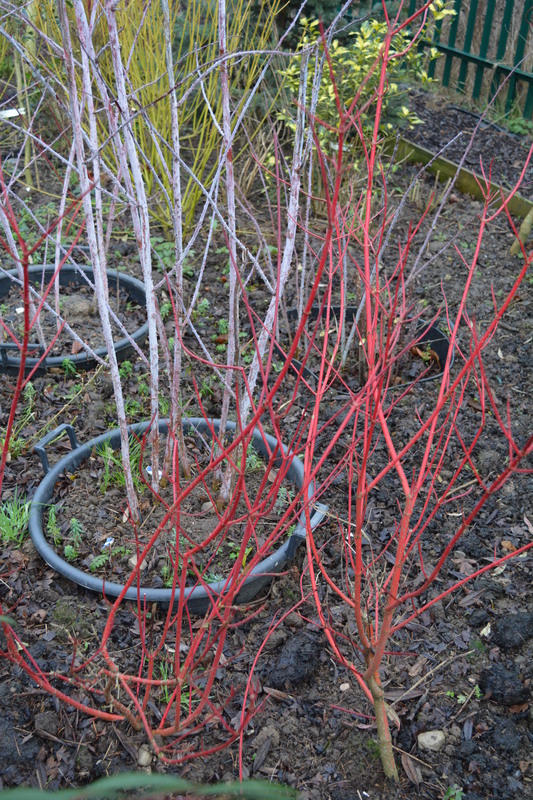 The coloured stems of different forms of Cornus and Salix give us reds, oranges, greens and yellows and even black. 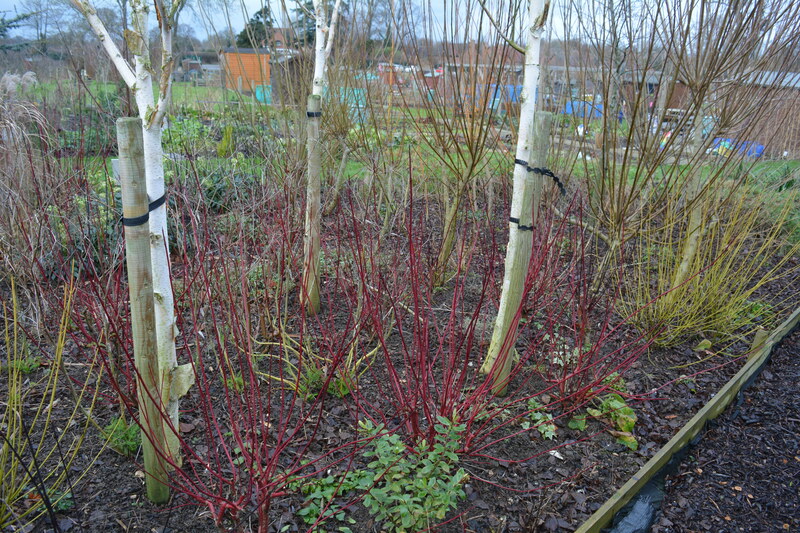 The white stemmed Birches are now over 20 feet tall and they dominate this garden. 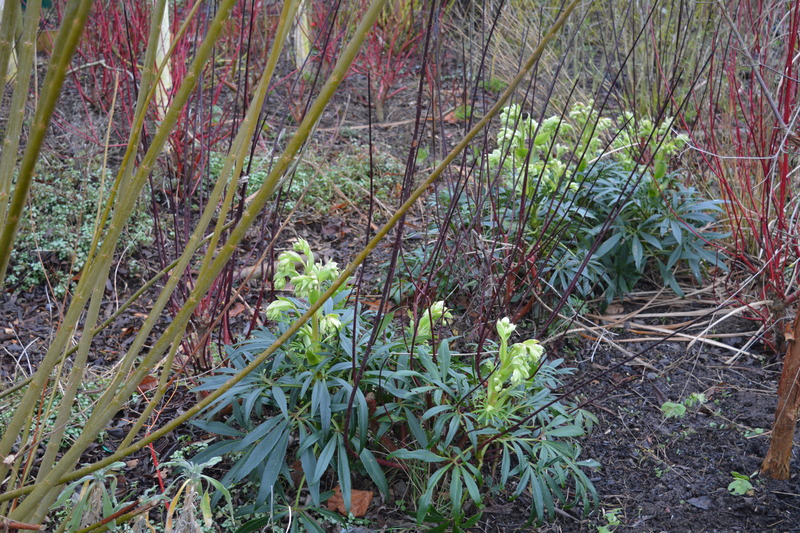 Euphorbias and Hellebores give colour at close to ground level, while the Viburnum bodnantense “Dawn” and Cornus mas provide pink and chartreuse at eye level. Both these shrubs are also powerfully scented. 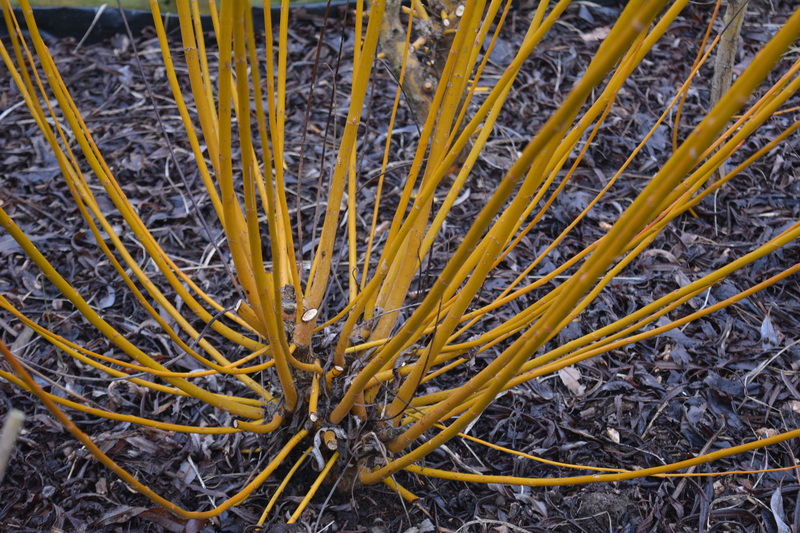 Elsewhere the coloured stems of a Salix in our Withy Bed shines gold and the Cornus “Midwinter Fire” glow like flames. 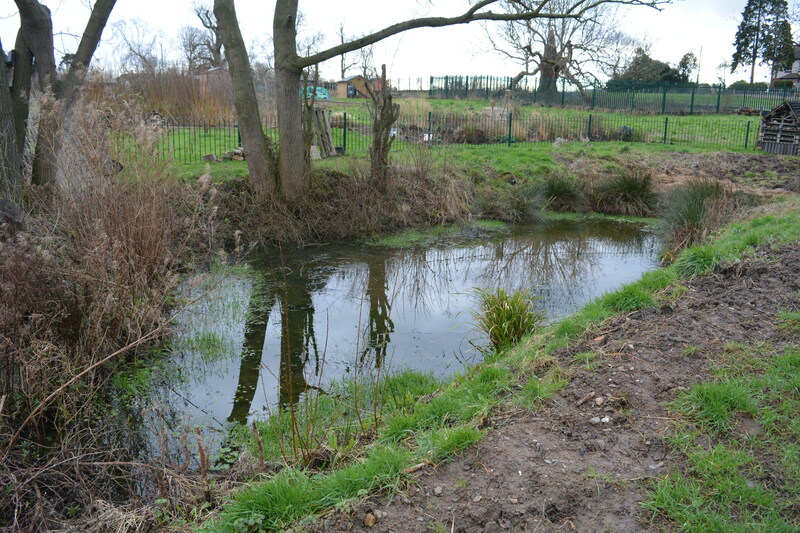 Our tour finishes off with a look at this year’s major project, our wildlife pond. 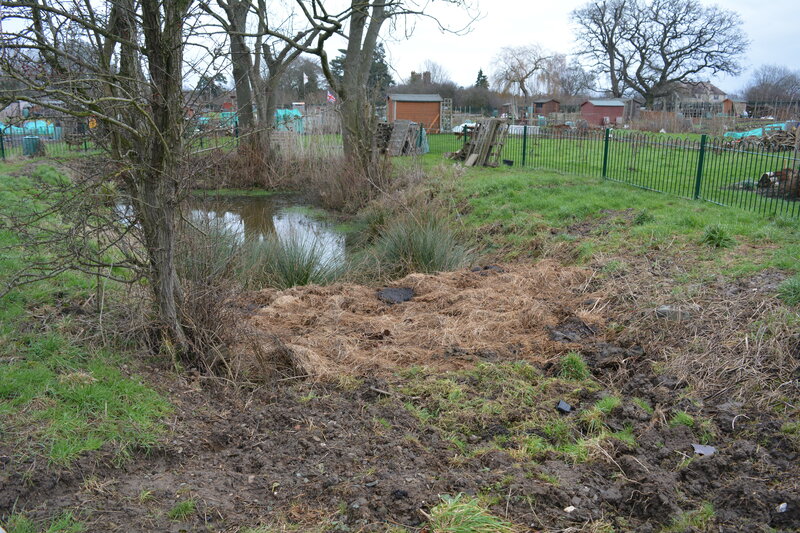 We inherited this large farm pond in the summer and are busy tidying up around it in readiness of the work that lies ahead. 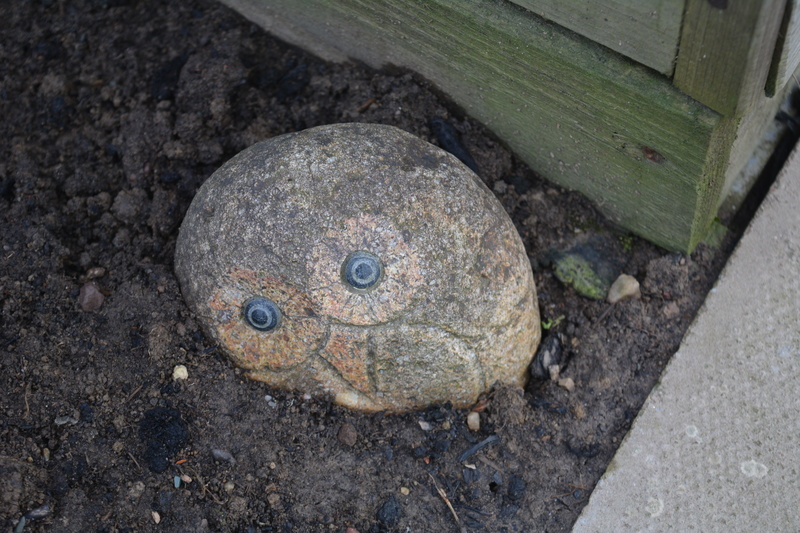 This little character is hidden for most of the year under a patch of Chrysanthemums grown for cutting but in winter he appears to cheer us all up. I shall finish this post with a couple of bright jewels. This entry was posted in allotments, colours, community gardening, flowering bulbs, fruit and veg, garden photography, gardens, irises, light, light quality, meadows, NGS, ornamental trees and shrubs, shrubs, spring bulbs, Winter Gardening, winter gardens and tagged allotments, birches, Bowbrook Allotment Community, Bowbrook Allotments, communal gardens, community gardening, cornus, dogwoods, fruit and vegetable growing, salix, scent, scent in the garden, scented plants, willows, winter, winter garden, winter gardening, winter gardens. Bookmark the permalink. 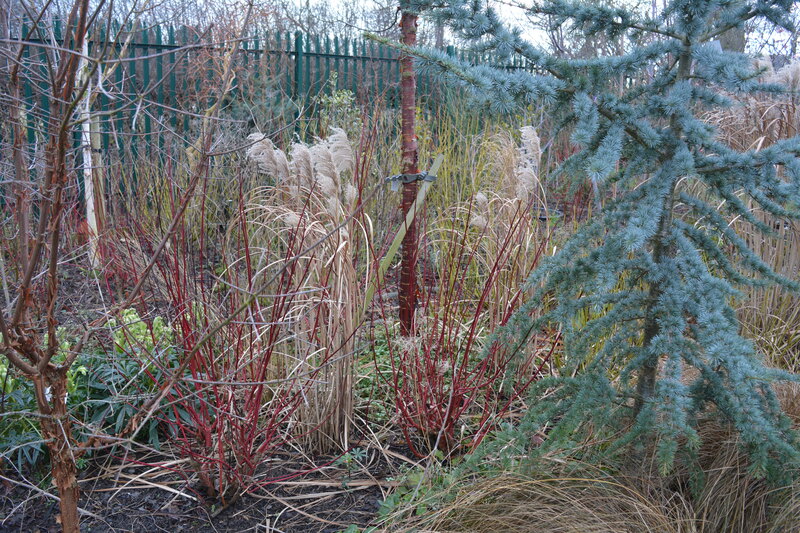 Sadly I didn’t the programme, how lovely to have your plot featured as wildlife friendly! I’ll look out for it on catch up if I can. 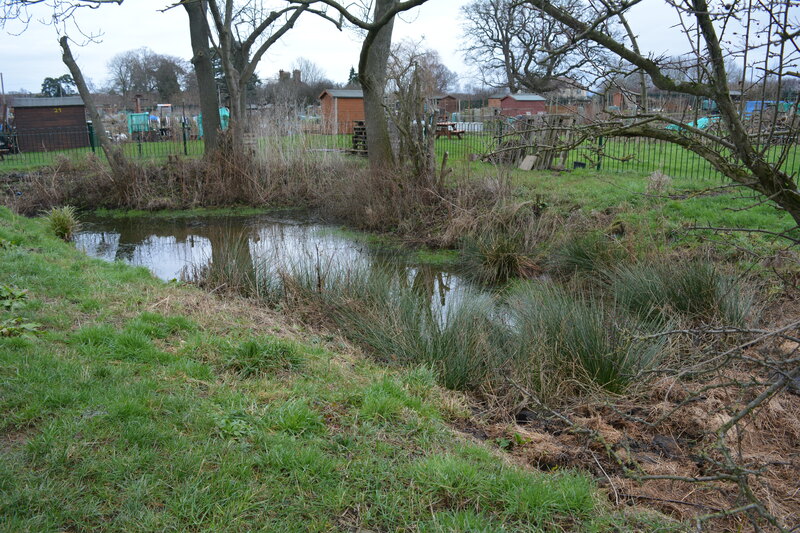 That’s a wonderful wildlife pond, what plans do you have for it? Beautiful Malc, I loved the lichen hedge filling the frame. 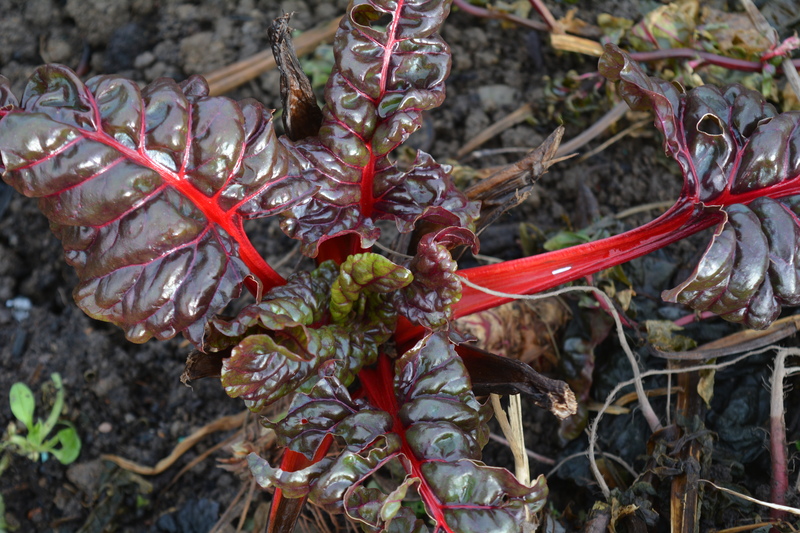 I can almost sense the tension in the garden now. 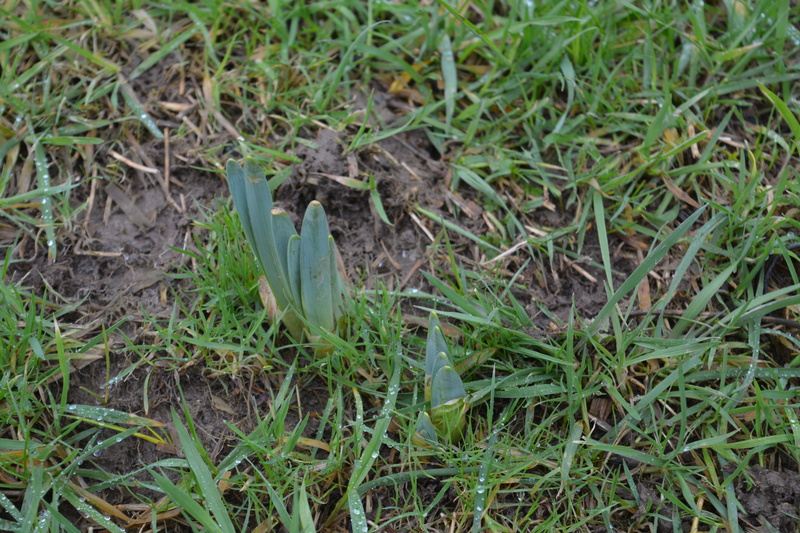 Is it going to sleep under February snows and ice or will it blossom in early spring sunshine?